This, the Nokia X9, is by far the most advanced and sexiest Nokia I have seen since the release of the Nokia N97. As good as the images look, this is just a concept made by a really talented Nokia lover. Whether Nokia will grab this idea and launch this baby is unlikely to see. Did you recognize the perfect twitter and facebook integration? The big players like Nokia, Apple and Samsung should really take a look at this. Man, i really love this. I loved the X6, but it was a little pricey. Symbian 3 and a 1 Ghz Snapdragon processor and 256 or 512 MB RAM. I hope, Nokia wil soon publish a Symbian^3 Demo on a device, because it looks like, it will take a LOT of Ram and Power. It think on current Nokia devices Symbian^3 it will lag. Nice images and concept. However, I don’t see any hardware modifications directly to 3rd party sites like twitter and facebook. While they are popular today no one can know for sure if they will be here tomorrow. To build something that is hard-wired into a device is just telling people not to buy the device if 1. They don’t use social media, 2. Those 3rd party sites collapse and/or the social media fad fades, and 3. The price will make the phone unaffordable to the target audience as the 3rd party providers are going to want their piece of the pie too (nothing is really free). Facebook and co won’t charge any money for this, that’s for sure. You are right at the hardware-issue. I think it’s gonna be better, to make these buttons at the bottom Softwarekeys that are customizable. For me, the integration into the UI is just great, that’s how it goes! The C5 will have Facebookintegration within the Contacts already, so this isn’t that far away. 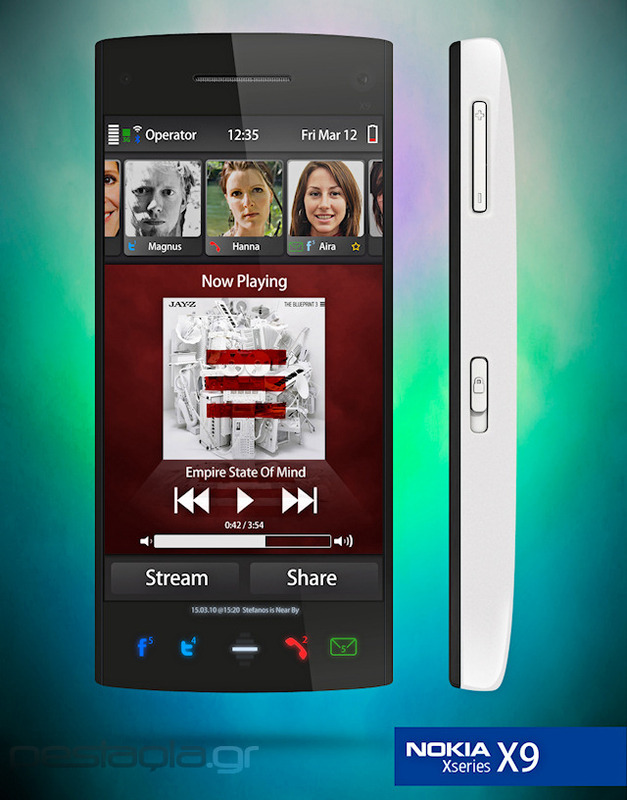 The UI we are seeing looks just like Symbian^4. @CwMbest: It’s unlikely to get Symbian^3 on an N97 for example, because the current Symbian-devices are lacking the grafics-accelerator. I hope, this Nokia X9 will be available in Germany too! Also wenn es kommt, dann wird es sicher auch in Deutschland erhältlich sein 😉 Eine Qwertz Tastatur noch dazu, und das Gerät ist perfekt! Not bad. I think they took that notification panel below the screen idea from the N87 concept on that youtube video. While I like the idea of the notifications being there, I can’t stand touch sensitive buttons like that. If they could somehow make them hardware buttons that actually had a click to them, and still could show the same changing images, that would be perfect. giá kể nokia có thể tạo ra điện thoại cấu hình khủng 2 sim và có đèn pin có thể phát sáng hoặc tự di chuyển đến chỗ chủ nhân hoặc nổi trên mặt nước khi có cuộc gọi.